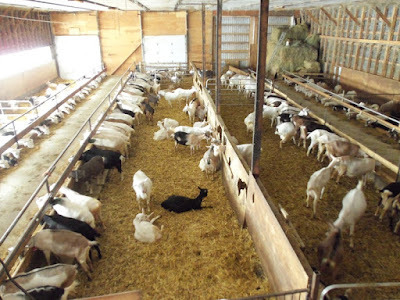 This week, I present to you goat farming, another simple to operate, cost effective, low-risk venture but which also has great potentials for high return on investment. The agribusiness is no other than goat farming. I hope you will take advantage of the opportunities it offers to create fabulous wealth and employment for yourself and family. Why goat farming, you may ask. Though it is a business that is common, it can be turned into a gold mine if only you would discover the secrets. These are the things I will reveal to you in this edition, just to help you succeed in owning a business of your own without necessarily breaking the bank vault. Goats are one of the earliest domesticated animals. The male goats are known as bucks or billies while the female ones are called does or nannies. Their young ones are called kids. Goats produce delicious, low fat meat. It is a popular delicacy in food joints, beer parlous, restaurants, hotels, you name it. It is prepared in a number of ways of which the most popular are goat pepper soup, isiewu (goat head), nkwobi, barbecue, etc. In short, no eatery is complete if goat meat in one form or the other is not there. Production of goat milk is new here but it is a goldmine waiting for somebody to exploit the potentials. The milk can be taken fresh in that it is bactericide (bacteria killer) or can be used to produce cheese, yoghurts, or jams. Goat wool is used in the production of fabrics, carpets, and knitwear. It has a lighter weight, softer than sheep wool. Goats dung are very good manure for your crop farm or you could convert it to cash by selling it to farmers. You can make money through commercial goat farming by these various ways. So, goats can be reared for meat, milk, hair, fibre and skins depending on the type of breed. There are over 300 breeds of goat in the world. The meat breeds are the Spanish, Boer, Kiko, Beetal and Tennessee. They have large body mass and can easily gain weight. The dairy breeds are Alpine, Nubian, LaManchas, Oberhasli and Saanen. Then you have the wool breeds such as Angora, Pygora, and Cashmere. You also have the dwarf breeds such as the Nigerian dwarf and pigmy goats. Although this type is very attractive, it may not be commercially viable for a beginner. Note also that there are cross-breeds. Goats can be reared free range or short perimeter fence could be constructed to give them protection from adverse weather or predators such as coyotes, roving dogs, cougars and bears. They need space for movement especially during pasturing. It is nice if you have enough space for feeding and grazing. There is need to construct few sheds where they would stay when it rains or when the weather is too hot and for their relaxation. Goats feed on grass, green branches of trees and shrubs, kitchen wastes and grains such as corns and beans. If you want the goats to grow and to reproduce rapidly, you need to take the issue of their feeding very serious. Give them enough to eat always. Although they do not depend on processed feeds, adding vitamins, minerals, and salt could enhance their wellbeing optimum production. Goats reproduce quickly and good species always give birth to twins or even triplets if they are well fed. They often mature between six and 12 months, depending on the breed. Some are faster than the others. Before you launch into commercial goat farming, you need a business plan. A business plan is a written document that gives the direction of the business. It acts as a guide to the business. Without a solid business plan, it would be difficult to make a headway. The plan should contain the aims and objectives of the enterprise, ideas and steps to be taken to achieve the desired objectives. It provides relevant information for prospective investors and acts as a tool to measure the performance of the outfit over time. A good business plan can be helpful in obtaining bank loans, securing contracts and attracting resourceful personnel to project the enterprise to stakeholders. As a result, the plan ought to be informative, relevant, realistic and practical. Select your breeds from a healthy source for a start. Also, ensure that the breed you select is marketable in your area of operation. The amount of capital at your disposal will determine the size of your farm. Nonetheless, you can start even small, with as little as N20,000. A small goat sells at between N6,000 to N12,000 while a mature goat goes for between N7,000 and N30,000. You can start with two males and many females. Then you continue to add more and more as time goes on and as you pocket and space permit. Goats suffer a number of diseases such as tuberculosis which creates in them difficulty in respiration, coughing, loss of weight or anaemia. There could also be salmonella infection whose symptoms are low milk production and loss of weight. Contaminated drinking water is usually the causative agent. There are also mouth and feet diseases. Engage the services of a veterinary doctor and always de-worm and vaccinate them when necessary. It is advisable to have some sort of training before starting. This is to avoid losing money through avoidable mistakes. Learn everything you can about goats. An on-farm job or internship to learn the basics of goat farming first-hand will put you in a good stead. Visit goat farms in your locality, talk to goat farmers and learn from them practices that guarantee a successful venture. Attend seminars if you can. It helps. Marketing is very important to the success of any business. The object of your being in business is to make profit. You will discover that without marketing, you will not make sales and if you fail to make sales there won’t be money to sustain the business. Before even you start, conduct market research as to where to sell, how to sell and to whom. If at the end of the exercise, you could not come up with enough potential buyers and the means of reaching them, don’t start. This is because the business would be dead on arrival. The large population of Nigeria shows that there is large market for goats. Almost all the people savour goat meat. In short, there is always a short supply of goats, such that they are imported from Niger and Chad to meet shortfall. Goats sell more at festivals. So the farmer can target festivals such as Christmas, Easter, Eid-el-Fitiri, end-year ceremonies and the likes. Goat farming offers a number of opportunities to make money. Apart from selling live animal or meat, you can make money from milk production, manure, hides and skin, and so many other ways. Again, for the fact that setting up the farm and the feeding do not cost much, profit prospect is very high. Those who are in it attest to the profitability of the business. Try it you will succeed!